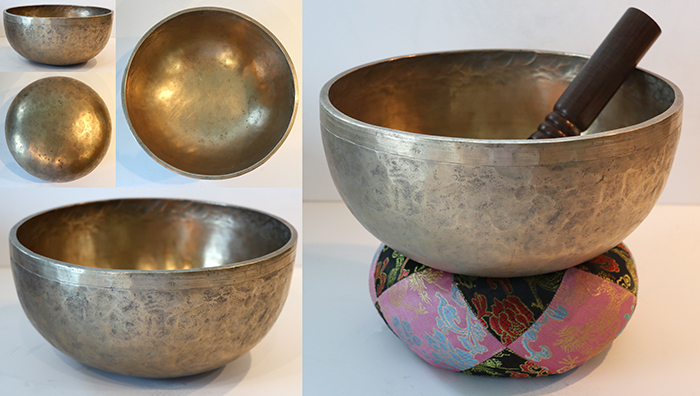 This is a perfect example of the classical Jambati bowl form, and in a much sought-after size (medium-size Jambati bowls of this weight sit comfortably on the palm of the hand and can be played for an extended period without tiring). Furthermore this is an exceptionally fine specimen that has been expertly forged. It has finely hammered even walls, a level sheered lip, circles at its centre, and a smooth decorative band encircling the outer rim that contrasts with the hammered surface below. The fundamental note switches between a third octave D (143Hz) and a perfect concert pitch third octave C# (139Hz) when struck with a padded mallet or played around the rim with a suede ringer. Sometimes both notes are simultaneously present. The rim note will also build to a middle G# (420Hz) if desired. This is a versatile bowl and experimentation with different strikers, ringers, and playing techniques will bring out any one of the above notes. This superb antique Jambati singing bowl is structurally sound, clean and blemish free, with an attractive golden bronze colour. It would make a perfect gift for someone special or a fabulous first bowl. A Tibetan silk brocade bowl cushion, a small padded striker, and a double-ended teak and suede ringer are all included in the price.